International travelers. British Airways Avios are valuable in the rewards points world. By spending $30,000 on the card within the first year, cardholders can earn up to 120,000 bonus Avios. That will come in handy when booking flights to Europe. Compare this card to other airline credit cards. 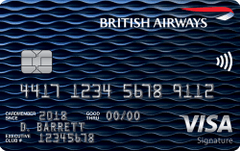 Our take: The British Airways Visa Signature card is fantastic for avid travelers, and its varied and generous benefits perfectly mitigate the relatively high annual fee.